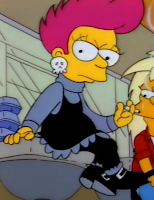 Goth Girls in Cartoons: In Memory Of. . . . In Memory Of. . . .
Alas, these Goth girls only appear in a single episode. Laetitia Bowers in "New Girl in Town" (As Told by Ginger). Though the show is now rarely seen on Nickelodeon, I still remember this episode. The new girl is a Goth named Laetitia. She always brings a skull around, even at the cafeteria, but she admits that it’s mere plastic. Her father is a mortician and drives his daughter around in a hearse. The popular girls at school gossip that he accidentally embalmed his wife alive. Ginger and the gang then hosts a party in Laetitia’s old Victorian house to gain her more friends. Malaria in "Grim in Love" (The Grim Adventures of Billy and Mandy). The episode is alongside "Crushed! ", where Mandy also falls in love. Of course, Malaria is the one the Grim Reaper would fall for (better get your hopes up, fellow admirers of Death). 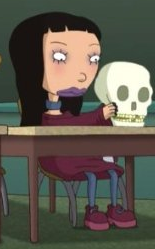 She’s fashioned from Morticia Addams, and the first thing she says to Grim is “You just sucked the life out of me.” They have a romantic montage in the cemetery and a zombie club. But in the end, Malaria’s Gothness shatters when she finds out that Grim is the real deal. She appears in the show's opening sequence from then on. Electra in "Hercules and the Complex Electra" (Hercules the Animated Series). Hercules falls in love with this non-conformist, and changes his looks and personality into that of a beatnik, because Electra doesn't like heroes and even writes a poem denouncing them. She hangs out in a Grecian-style Goth club that serves pomegranate juice. Reminiscent of Sophocles's play, Electra has the power to summon Furies whenever she's angry. In the original myth of Electra, she plotted revenge against her traitor mother and stepfather for murdering her father, Agamemnon, after the Trojan War. That is indeed "darkness within". Tak from "Tak: The Hideous New Girl" (Invader Zim). Created by Jhonen Vasquez, the author of the dark comics Johnny the Homicidal Maniac, the show was unfortunately canceled before Tak becomes the main antagonist in future episodes (doom be hailed upon Nick!). She only appears once as a Mary Sue-sque character, yet becomes an instant fan favorite. 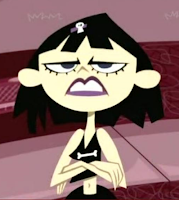 After luring Zim during Valentine's Day, she reveals her grudge and plot against him for unwittingly destroying her chances to be an Elite Irken Invader. Together with her cat-disguised SIR unit, Mimi, Tak almost destroys Earth using meat. Halloween in "Depth Takes a Holiday" (Daria). This personification of Halloween is a rebellious, prank-loving and selfish Goth girl who plays drums, and leaves cobwebs wherever she goes. Though one of the popular kids, she despises Holiday Island because they have to be happy all the time. She, Christmas and Guy Fawkes' Day then come to Lawndale, and form a rock band with a "hiphop-punk-electronica vibe". But the trio always get on each other's nerves, and start a brawl. 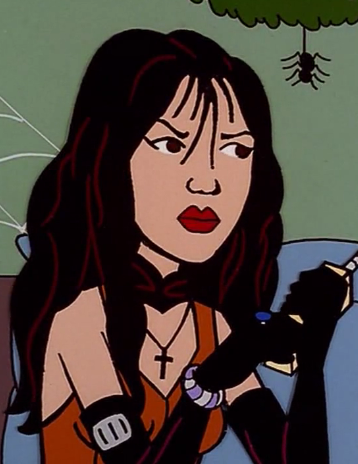 In their absence, people's zeal for their holidays fades away, which the sardonic Daria would care less. Fans consider her every-holiday episode among their least favorite, it being too cartoonish for the series. Argent in "Calling All Titans!" (Teen Titans). Aside from Raven, Argent is another dark and gothy superheroine. She even asks for a black communicator to go with her outfit. In the episode, she meets Starfire and becomes an honorary Titan, but she is soon captured by the Brotherhood of Evil, because they want her super power. Argent can fire crimson energy beams, and can use that energy to form objects, similar to Green Lantern. She can also fly at high altitudes and speeds. 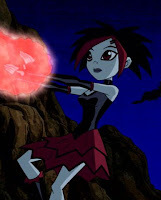 In the original comics, she's half-alien, summoned during her sweet sixteen party, and instead of crimson, her plasmas are silver, like her skin, and usually turn into daggers. Inky Rose in "Honest Apple" (My Little Pony: Friendship is Magic). It is a delight to meet a Goth pony in the sunny, pastel world of Equestria. 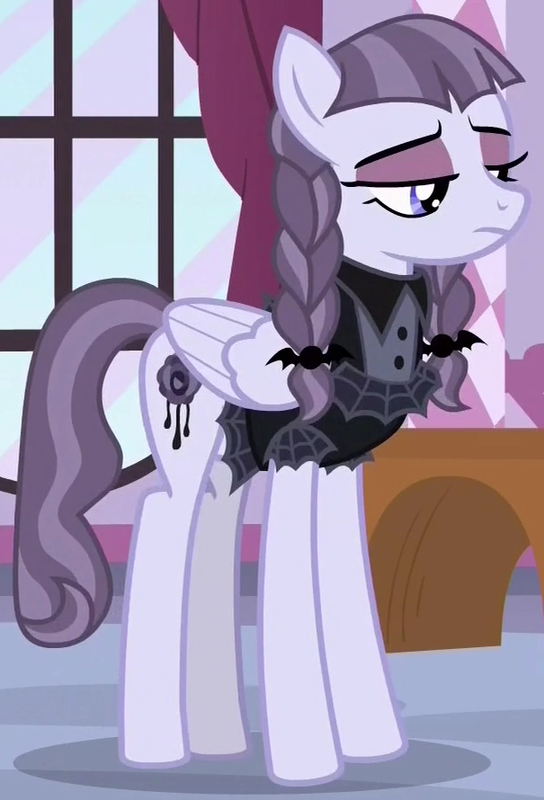 She is a purple pegasus with a dripping black rose as her cutie mark. 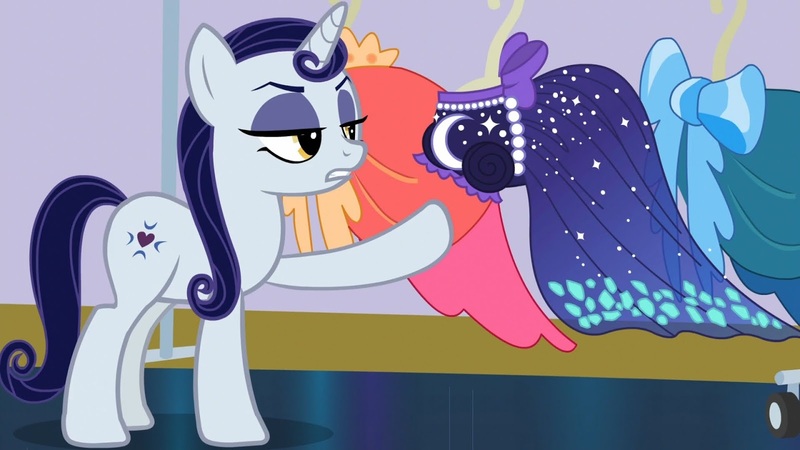 She talks in a deadpan demeanor, like another Goth pony and fashion patron, Moonlight Raven. Inky Rose is one of the contestants of Couture du Future, Rarity's fashion contest. Her designs are along the vogue of military Goth, with lots of black, distress and buttons that "convey sadness". Judge, Hoity Toity, votes for her, and remarks that simplicity is the keynote of true elegance. This makes Inky Rose so happy that she forces herself a broken smile. 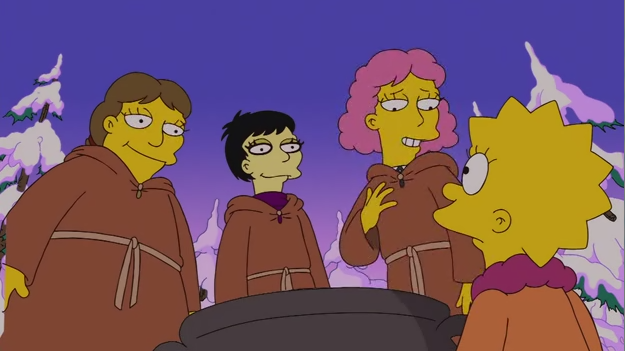 Donna in "Separate Vocations" (The Simpsons). When Lisa's aptitude test reveals she is better fit to be a homemaker, she loses interest in her academic performance. She enters the bad girls' bathroom, and meets a Goth and a grunge girl smoking. Lisa earns their admiration by suggesting worse pranks to pull off. She meets a friendlier Goth in "Rednecks and Broomsticks", and joins her Wiccan coven. In their court trial, she is addressed as Gwendolyn Nightshadow, which "is not even my real name. It's Stacey. Stacey Deathsatan." 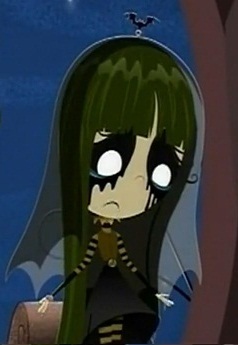 Morose in "I'll Be Home For Misery" (Ruby Gloom). Misery hosts a reunion for her all-female family, whose names start with M, and each also have their own disaster to suffer from. Morose is the most melodramatic of them, yet quite fashionable. Her dress pattern is called "the abyss, on a dark night, in the middle of nowhere." She has a voodoo doll that she walks around on a leash, but despises playful children. She plays the keyboards in their family band, until the whole house literally falls down due to their genetic bad luck. 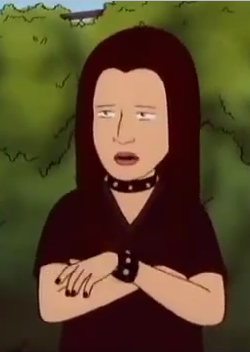 Goth student in "I Never Promised You an Organic Garden" (King of the Hill). Kids who don't want to enroll in gym ends up in the gardening class; unathletic kids like Bobby, Star Wars nerds, meek girls and this Goth girl. Peggy Hill volunteers to be their new teacher, and tells them to get on working. Yet the Goth girl informs her that the former teacher usually does all the stuff, and they mostly "sat around and whatever". Also in one scene, Peggy brings beer to lure away pesty snails. At the background, Goth girl's hand is seen grabbing a can. Nocturna in "Mall Girl Pearl" (Spongebob Squarepants). In this non-Spongebob episode, Pearl's friends are too busy working in the mall to hang out with her and talk about boys. One of them is Nocturna, who works as a cashier in Scorched Coral, but she finds it heinous and greets people to go away. She even lets a customer choke on a spiked bracelet. Pearl tries to get a job there, too, but a Goth look-alike already gets hired and hisses at her. When Pearl starts working at Grandma's Apron, she gets ridiculed by Nocturna and the others. Annasthesia in "License to Slumber" (The X's). The show is about a seemingly average family that consists of extreme secret agents. Tuesday is the teenage daughter who only knows what is normal, despite her punk-rock phase. In the episode, Mrs. X, trying to be a normal mom, arranges a slumber party for her daughter, while battling Glowface. One of Tuesday's friends is a Goth named Annasthesia. When she first entered the X's home, she "already despises them all." For more one-time Goth characters, go to Almost There. dude you listed all of my favorite characters on the show. I especially loved laetilia from as told by ginger and wished she was shown more often (she was so cool). 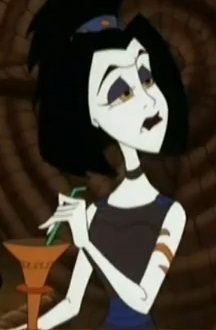 I also loved malaria from billy and mandy (even if she ran out scared in the end). Invader zim will always be the best show ever, right along with hey arnold. 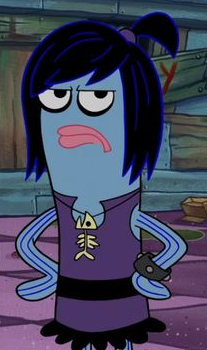 Hey Miss Haps.I heard that there was a goth girl in a cartoon called fish hooks. Most of them from my love of TV as a kid. Others are from extensive research. And some are suggested by friends and followers like Anonymous. Thanks guys. Where did you see the X's? I liked the show! It's from Nickelodeon. But it got canceled years ago. There's a site somewhere but I haven't encountered one yet. Hey, in your blog you have listed all my favorite characters. I especially loved Molly from The Fairly Odd parents and Malaria from Billy and Mandy. I've done some research on goths in cartoons before for college, but this is just amazing. I had no idea there were this many to be found. Wow. Nice blog ^-^ I have a suggestion for the blog *^* could you add something about gothic girls in animes (for example, Re L Mayer, Amane Misa, ....)? I got one. Britney from Alvinnn and the chipmunks. The new show on nick.